Whether you’re looking to exercise more to improve your general fitness or because you want to lose weight, you don’t necessarily have to commit to paying high gym fees every month. It’s possible to get fit for free or at very low cost. Take up jogging. 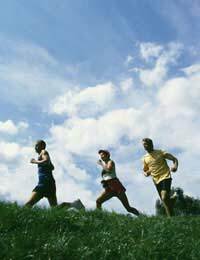 Running out in the fresh air is great for fitness and wellbeing. You get the great outdoors and some exercise without the cost of a monthly gym payment. Vary your route to stop things getting boring. One expense not to skimp on though is running shoes with good support or you could end up pulling muscles. If running sounds a bit too strenuous at this stage walking is excellent for health and fitness too. Many people enjoy walking as an activity in itself. However, it’s likely you’ll see an improvement in your overall fitness if you just start walking places you’d normally catch the bus, or getting off the bus a couple of stops earlier. Play a game with friends or family. Games such as frisbee and rounders are great exercise and a lot more fun than the gym! You’ll probably enjoy the game so much that you’ll forget you’re trying to improve your health and fitness. Get out in the garden. Gardening may look leisurely but it’s actually great for health and fitness and many people also find it very calming and therapeutic. Lawn mowing is especially good! Make small changes such as taking the stairs instead of getting the lift. Put some welly into the household chores. You’ll be saving money on a cleaner and the gym! Hoovering and vigorous polishing are particularly good exercise and waxing is good for toning upper arms. Even if you’re not the outdoor type you can still get fit without having to make monthly gym payments. Try checking fitness videos and DVDs out of the library or looking out for them in charity shops. Rotate them regularly so that you don’t get bored. Vary the type of exercise you do too. For example, some videos and DVDs are based on aerobic activity and others are based on toning exercises such as yoga and pilates. If you enjoy gym machines but can’t afford gym payments it could be worth investing in home gym equipment. Although there will be some initial outlay, it will be cheaper in the long-term than monthly gym payments. Look out on sites such as Freecycle for equipment such as exercise bikes and rowing machines. Buy a bike (second-hand if you can!) and take up cycling. Cycling burns up to 600 calories an hour. By cycling you’ll strengthen the muscles in your legs and raise your heart rate. Make sure you wear a fluorescent vest and a helmet. Go to the local swimming pool and do a few laps. Entry is usually less than £3 a session. Swimming is great for health and fitness because it is low impact on joints but provides a good cardiovascular workout and is good for muscle toning.